The Warcraft franchise looks like its entire world was made from children's balloons. It's nothing but big shapes and bright, bright colours. 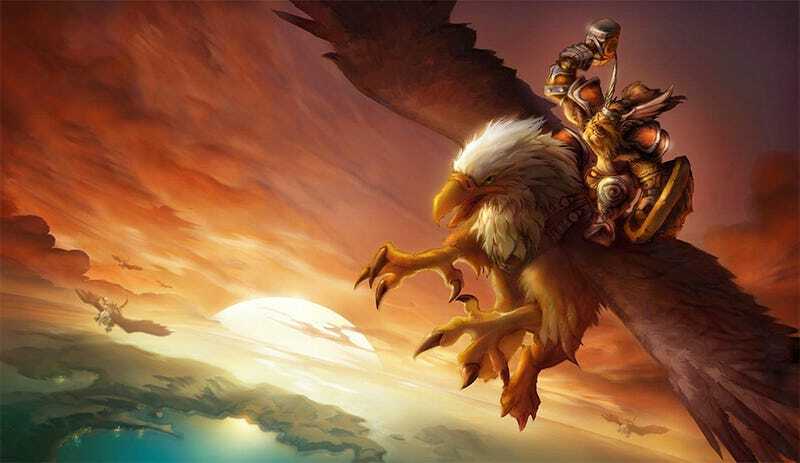 Love it or hate it, it's become an iconic style, something that's helped World of Warcraft not only run on anybody's computer, but look unique in doing it. But have you ever wondered why Azeroth and its people look the way they do? When so many other fantasy games, Blizzard's own Diablo included, opt for styles a little less "Saturday morning cartoon"? There's a couple of very good reasons. And they date back all the way to the development of the very first game in the franchise, Warcraft: Orcs vs Humans. In part two of his big look back at the making of the landmark RTS title, former Blizzard exec Patrick Wyatt says "If you consider the artwork of the Warcraft series, you'll see that the colors are shockingly loud in comparison to, say, Diablo, where only in a dim room is it truly possible to see the beauty of the art. The bright, cartoony art-style was different from the style of many other PC war games of the era, which hewed to more realistic color palette." "Part of that difference can be explained by the past experiences of our artists, who had worked on several Super Nintendo and Sega Genesis console titles, where games required more dynamic colors since televisions of that era were so much worse at displaying colors than PC monitors. Console games on TVs, which had lower pixel resolution and color bleed, needed high-contrast artwork to show well." That's one reason. Makes sense! The other one's a little stranger. "Another reason was at the behest of Allen [Adham, Blizzard's co-founder], who charged all the artists with drawing artwork in bright conditions. He'd regularly stalk the halls of Blizzard turning on lights and opening window-blinds." "His view was that most folks play games in bright rooms, so our artists should be authoring our games to play well in that environment. He argued that it's easy to draw artwork that reads well when viewed in a dark room with no outside light can distract from the monitor. But when computer art is competing with bright lights it's much more difficult to see. And fluorescent bulbs are the worst form of light available - the cold, flickering glow of their tubes tires the eyes and washes out colors." "So the lights were always on in the art rooms to force artists to compensate for terrible lighting by creating art that accounted for those conditions. These working conditions chafed on some (all?) of the art team, but ultimately led to artwork that stood out compared to products of the day." Art that, the odd imitator aside, continues to do so today. You can read more of Patrick's fascinating look back at the link below.